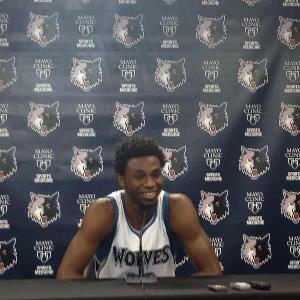 Good debate: What is Andrew Wiggins' ceiling? Two ESPN basketball experts debated whether his game will keep getting better (think Kevin Durant) or flatten out (think Carmelo Anthony). Andrew Wiggins is clearly one of the most important players on the Timberwolves, so a recent back-and-forth debate between ESPN.com’s Chad Ford and Kevin Pelton was interesting and relevant. Basically, both basketball guys were trying to figure out what Wiggins’ ultimate ceiling is. Does he project as a future MVP in the mold of Kevin Durant — a guy who keeps adding pieces to an already impressive game? Or will he flatten out as more of a Carmelo Anthony type who can score but doesn’t offer much else? (Which, it should be noted, would hardly be terrible). Along the way, they talk about whether Sam Mitchell is the right coach (debatable), how good the nucleus is around Wiggins (they like it), why Wiggins’ defense seems to be lagging (complicated) and other subjects. I like Ford’s conclusion that Wiggins should be the kind of player who keeps getting better because he’s willing to put in the work. Wiggins really is an interesting case study. Watch him on a nightly basis and he does three or four things that make you think this guy is (or is going to be) a superstar. Every scout I speak to loves him. Virtually all of them think he’s going to reach that level. It’s hard not to be attracted to his game. And when he’s averaging 20-plus points a night and is already helping the Wolves to a surprising start, it’s easy to get excited. The advanced stats aren’t nearly as enthusiastic. But this may be a case where the eyes are seeing what Wiggins can become while the numbers are telling us what he is right now. It’s an Insider story, so you’ll need that access to read the whole thing. All I know for sure: Wiggins needs to start making his and-one free throws. He’s a very good free throw shooter, but for some reason this year he’s just 7 for 18 on free throws that come during a chance for a three-point play. It’s bizarre even for a small sample size, and it’s oddly deflating when you fail to cash in on those.